DERRY TWP. - Ten more pets - six dogs. two cats and two ducks - were taken from a trailer park Friday, and the pets' owners have been charged with neglect and animal cruelty. Those 10 animals have joined 30 others that were rescued last week from a trailer at Blue Springs Trailer Park outside of Washingtonville. Many of the animals were sick, starving, and living in their own feces, said Wayne Risch, humane officer with the Animal Resource Center. The animals were discovered by sheriffs deputies when officials evicted a family there. Risch has charged four trailer park residents - Dottie English, Norman Roberts, Kay Hoyer and Randy Long - with animal cruelty. Now the rescued animals are being treated by veterinarians and the search is on to place them in new homes. Cyndi Lindenmuth, adoption coordinator for the Animal Resource Center, said the animals are going to need a lot of special care. Some of the dogs are not housebroken, she said. And the stomachs of many of the dogs have shrunk after years of malnourishment. So they need to be fed four times a day, to stretch their stomachs back out. Many of the dogs also had whipworms, so they need to take daily medication. "It's going to take some people who are willing to really give the TLC they need," Lindenmuth said. Although the dogs were neglected, they are all very friendly. "The saddest part is they don't even know they were abused," she said. "That's just so sad. That just breaks my heart." The dogs are now staying at foster homes, Leighow Veterinary Hospital, Animal Care Center and Bloomsburg Veterinary Hospital. All 20 rescued cats are staying at the Purrfect Love Haven for Homeless Cats in Nescopeck, Risch said. They've been fed, bathed, treated for fleas and visited by a vet. On May 19, sheriff's deputies evicted a family from trailer No. 45, and the family voluntarily gave up 30 of the animals -12 dogs and 18 cats. At that time, the family was allowed to keep several of the healthier animals, Risch said. 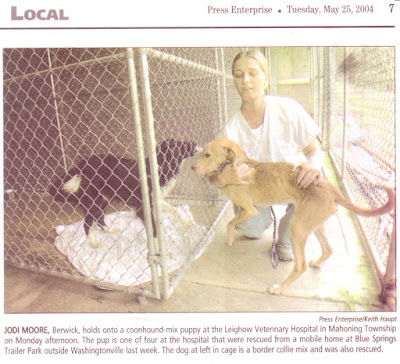 But when vets examined the rescued pets, many had hookworm. Risch returned to the family, and told them they'd have to take the remaining animals to the vet too, to get them checked. The family wasn't able to afford that, so they gave up six more dogs, two cats and two ducks. The ducks were taken to a local pond, Risch said. Risch said he allowed the family to keep just one dog, who seemed very healthy. The family also kept a turtle. Lauri Sheibley can be reached at 275-2104 or emai?ed at lauri@pressenterprise.net.